Public page: March 2019 Mulgowie Weekend created by Alison Bell. March 2019 Mulgowie Weekend Private page created by Alison Bell. See you Friday or Saturday or both! Tell all your friends and encourage those who may have missed this event in their calendar. The gathering is held at the Mulgowie Hotel in the beautiful Lockyer Valley. This bi-annual event is organised by acoustic music lovers and hosted by Publicans Kevin and Kylie. Friday evening will start with a jam in the pub after dinner. Saturday morning there is a farmers market near the community hall and sports ground. Indulge yourself and purchase home-made body cleansing products, food, coffee, new plants for your garden and all manner of wonderful things. There are NO blackboard concerts, and NO sound gear. It is purely an acoustic music jam weekend. You are free to jam in the pub, on the front verandah of the pub, on the cabin verandahs and under the garden rotundas. All styles of music welcome, though remember this is a 'community event'. Camping is provided behind the pub and a limited number of cabin rooms/beds are available at each gathering - call, SMS 0437-736-799 or email Michael (editor). Fee: $10 per head for the whole weekend for all who stay in the Pub grounds. Fees are collected to cover the costs of hiring the cabin facilities (including a kitchen and two bathrooms for use by all – open from Friday lunchtime). Those who secured a bed may be asked to donate a little extra. STRICTLY NO PUBLIC BYO – please PURCHASE your alcohol from the pub! Laidley is a small historic country town only 80k west of Brisbane, between Ipswich and Toowoomba on the Cobb & Co Tourist Drive. Mulgowie is 10k south of Laidley. Laidley is only a short drive away with pubs, supermarkets and coffee shops, as well as a newsagent, so if you forget to bring anything,	you can get it there. See you all at Mulgowie! Usual dates are the SECOND weekend in March, and the FIRST weekend in October. NEXT event: Friday 8th to Sunday 10th March, 2019. Visit: Facebook - Maidenwell Folk Gathering for details. This bi-annual event is organised by acoustic music lovers and hosted by the Hotel Publicans Lisa and Adam (cousins). Camping is provided FREE behind the pub and there are toilets and showers available to campers. The camping area is spacious and you do not need to book, just turn up and set up. It is recommended that you bring your own drinking water. The pub does excellent meals (lunch and dinner) and has EFTPOS facilities. There is also limited accommodation available at the pub – ring Lisa or Adam for more details 07 4164 6133. Breakfast is available at the Maidenwell Trading Post, across the road. The Trading Post also sells fuel and has basic food and toiletry supplies, newspapers, ice-creams, cold drinks etcetera. The event officially starts Friday evening with a jam in the pub after dinner. Saturday there is jamming in and around the pub and the camping grounds and Saturday night there is an unplugged blackboard concert starting at around 6:30pm – see one of the organisers to put your name down! All styles of acoustic music are welcome but remember this is a community event. Strictly no BYO – please purchase your alcohol from the pub. This event, begun by Glen Donald about two decades ago, has been growing in recent years and was truly a wonderful, musically diverse acoustic gathering. The event has the full support of the publicans, the local community and local musicians. Maidenwell, gateway to the Bunya Mountains is on the Kingaroy-Cooyar Road. there's a sign for MAIDENWELL. Turn left - about 10km. ● Gympie/North Coast: a very nice one-and-a-half hour run through Nanango. Toowoomba turn-off south onto the New England Highway. and search Youtube for "Maidenwell Folk Gathering" videos. Pencil March 8-10th 2019 & into your diaries for the next Spring Gully Event. In the weeks leading up to The Planting festival, engage in a range of distinctive courses led by a group of internationally renowned chefs, musicians, jewellers, gardeners, weavers and woodcarvers. Visit the ARTISAN CAMP Website for details. Tickets have been launched. If you’re keen to come along this year we suggest you get in early to purchase your ticket and save some dollars. The Planting sets its own pace over the May long weekend at Woodfordia. This three-day festival has emerged as a celebration of the handmade, the homegrown and our natural environment. We’re imagining you might see yourselves sipping hot chai under dappled light, yarning around the village fires, hearing inquisitive children making their own villages, cooking something tantalising from local ingredients, finding your next creative passion, indulging in some artisan craft beers, recharging your inner eco-warrior through inspiring speakers and escaping with the music and dance of passionate artists. The Planting full programme will be released on the 31st March. Visit the The Planting Website for details and tickets. 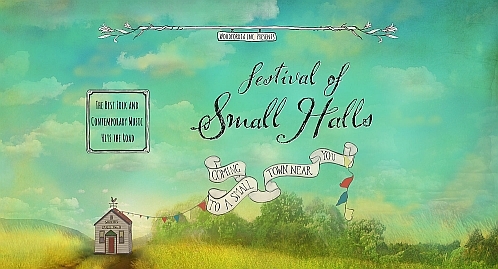 Festival of Small Halls tours Victoria, South Australia and New South Wales on the Autumn Tour 2019 – Port Fairy Folk Festival to the National Folk Festival.